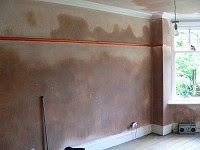 Only two days after plastering and the new lounge is drying out nicely, as you can see from this pic which attempts to capture the same area as the one I took on Friday. I put two weeks into the plan for drying out, because this is a North-facing room and a lot colder than the last room we had plastered, but I'd not accounted for two things. The new lounge has an open flue, so the moisture is flying up there, and the plaster is mainly skimming, which is a lot less deep than the study, where a lot of the original plaster was blown and had to be removed (or fell off!). With a bit of luck I'll be able to start painting next weekend. We were planning on visiting Beech Road festival today, but it was bucketing down around noon, so we decided against it. By the time the rain had passed over and the sun came out, we'd already settled comfortably into doing other things and couldn't be arsed to rouse ourselves. Lazy Sundays. Ya can't beat 'em. Days and evenings for flopping on sofas eating raspberry ruffles whilst listening out for raindrops.